Our second day in Buenos Aires started with a short walk around the neighboring barrio, Recoleta. We started coming upon more buildings that looked like Paris, most streets lined with streets, and more quiet cafes off on their own. 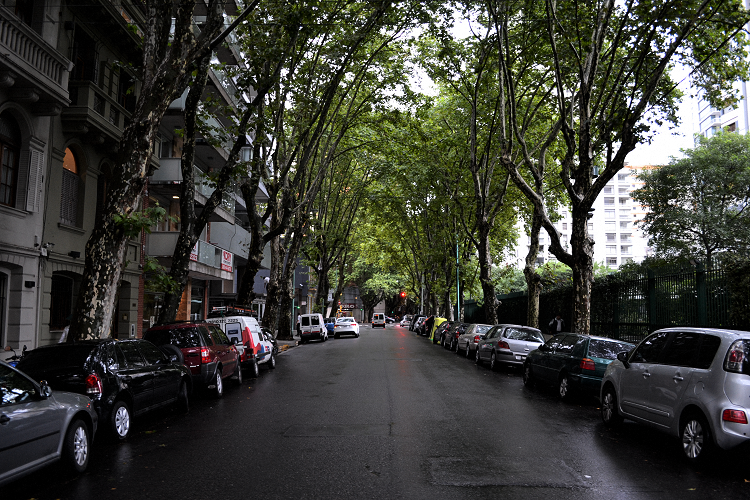 A more residential area, whereas Palermo is full of small shops side to side. We picked one cafe, on this block, and sat outside to have a cafe con leche and croissant to start the day. From there we hailed a taxi to go to the Colon Theater, a magnificent building that architecturally is dripping in details. 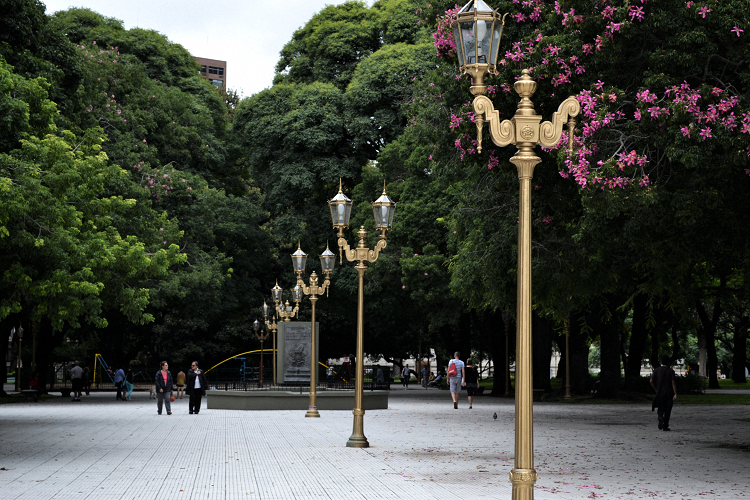 Buenos Aires is so large, that it takes us an entire afternoon just to walk around our little barrio that is Palermo. It would be a great hike to get to the heart of the next barrio over, let alone the other side of the city, Retiro, Microcentro, and San Telmo which is where we spent our second day. Taxis are so cheap, that it is just as economical for us to take a taxi ride for $6 US across town, instead of paying $2 US each for a subway ride. Plus, we get to see the city through a window and take note on places to see that we didn't know about when in a taxi! We arrived at Teatro Colon just in time for the first English tour - our Spanish is nowhere near good enough for an hour tour in their native language. 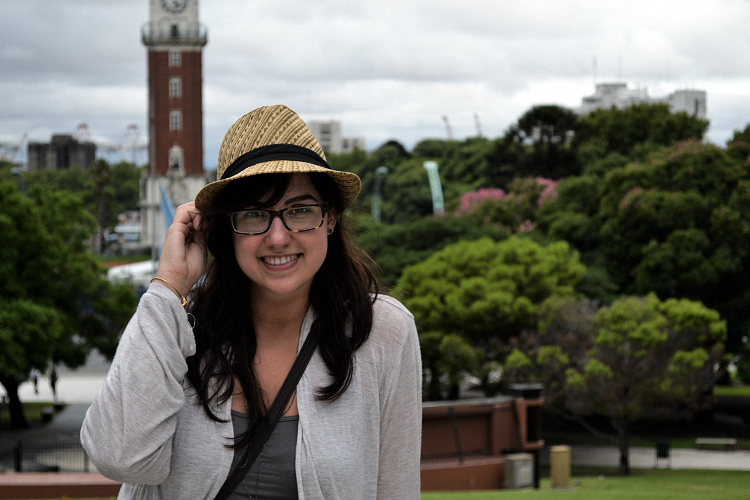 I highly recommend doing something like this tour one of the first days in a city like Buenos Aires. 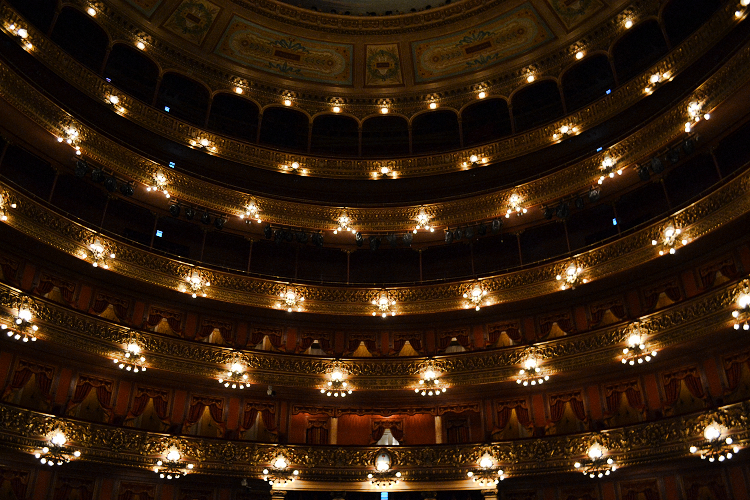 I learned so much about the construction of this theater, and even more about the history of Buenos Aires and how it came to be the "Paris of South America". We started in the grand hall which is where the guests with the most expensive tickets entered through. It was breathtaking, just as it was intended to be. The theater was closed until 2010 during a seven year renovation to restore it to as historically correct as possible. Stained glass windows in the salon were black, and gold moldings on the wall faded with all the cigarette smoke over time. 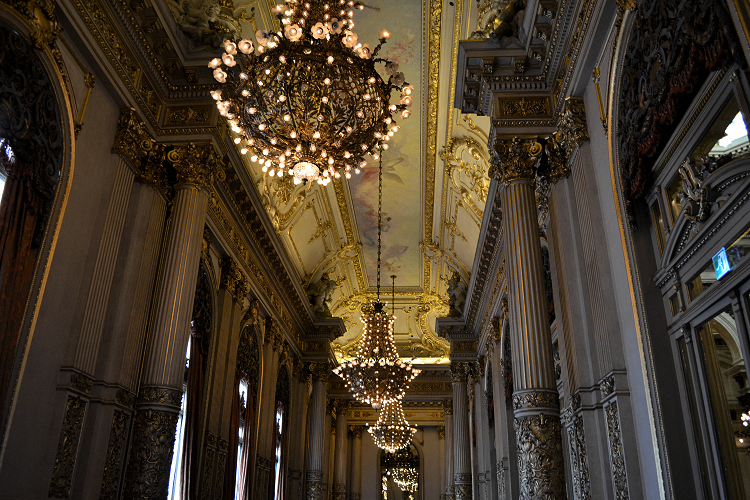 That hall of chandeliers is the salon, which was mirrored after Versaille's Hall of Mirrors. 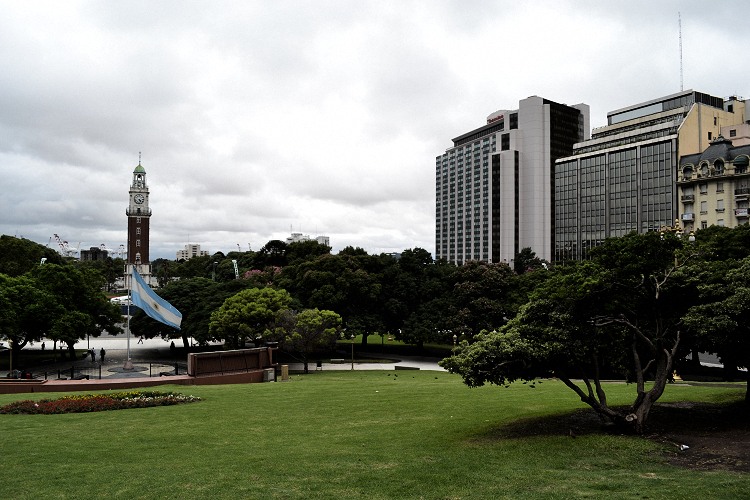 It shows Argentina's evolution to integrate more European style architecture and beauty into their own city. 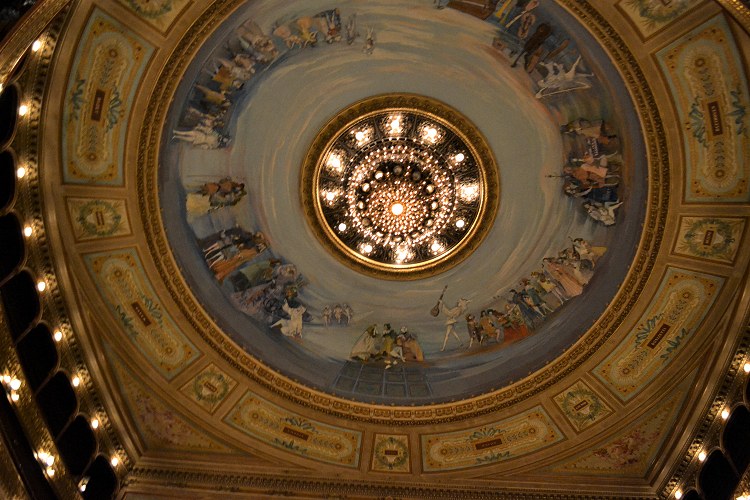 Last, but not least, the guide opened a thick curtain and we entered the grand opera theater. Seven floors of seating, with rows of chairs down below as well. There were boxes for guests to privately own, there was standing room on the top floor for inexpensive tickets, and there were glamorous boxes near the stage to not really see the stage, but to be seen by the crowd instead. There was even seating, below the private boxes behind iron grates for widows to attend the opera. A traditional mourning period back then was two years, and no proper socializing. However, this was a way for them to still attend a performance. 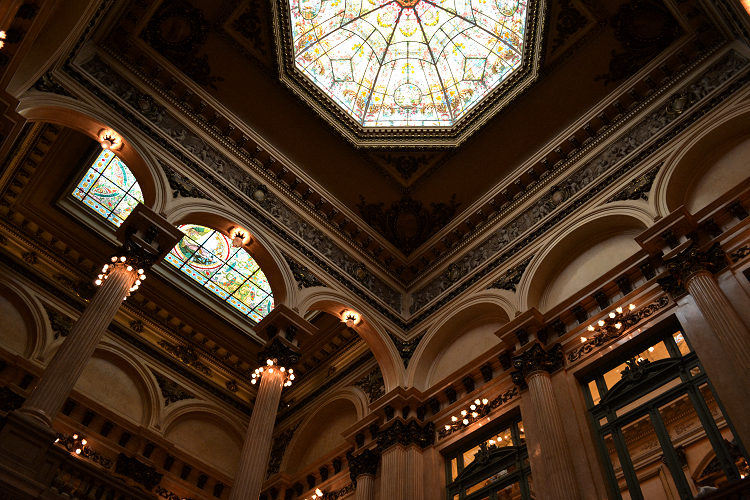 There was the most wonderful chandelier that was incredibly captivating. They said it can be lowered to the floor in order to replace bulbs and maintain the fixture, and that it takes 45 minutes to slowly decend. Also, a performer can go inside of it in during a performance! If there were ever a voice from God or any booming speeches that needed to come from above the audience, that's where the performer would do it. The original surround sound! From the we lunched at a place with close seating and men dining together on their lunch breaks in the heart of Microcentro - where all the business men work. We took a table in the corner and split a bottle of wine. It was a relaxing hour or two considering we had just walked up and down the entirety of San Telmo to and from the Casa Rosada, their pink city hall. I took that time to write in my moleskine, writing moments that I wanted to remember like crossing a 20 lane highway for the first time, and in heels no less. (You might be thinking heels are not practical for city exploring, but it was raining all day and the boots kept my feet dry while also adding lots of support for the long walks. No stilletos here). After lunch, we took a wi-fi break in a bar that I actually found on Instagram called La Cigale. 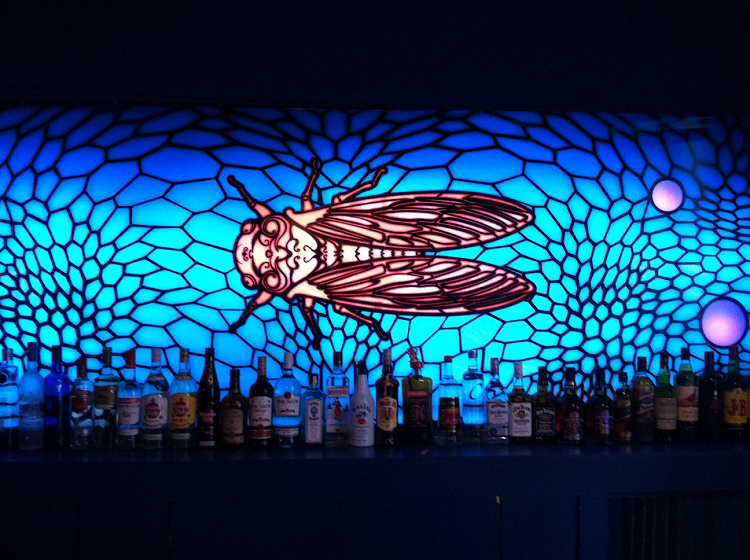 It stood out to me because of all the guest photos of the stained glass cicada that graces the back of the bar. In the afternoon, we were the only ones in there enjoying two glasses of Quilmes, Argentina's most well known beer. From there, we walked to the Retiro train station. 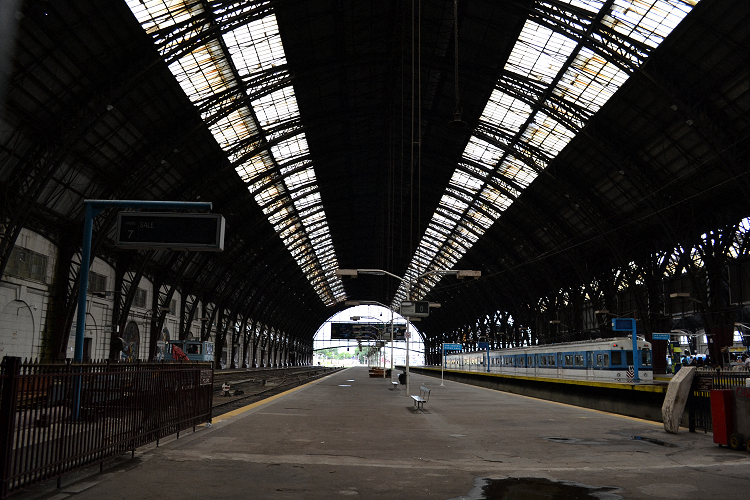 For one, photos make the terminal look pretty grand, and second, we wanted to scope out the train to a city called El Tigre that we hope to take a day trip to next week. El Tigre is a little city on a river, like a petite Venice. The walk to Retiro train station was through a lovely park. It had stopped raining just enough to enjoy the views and all of the dogs being walked. We had a taxi take us all the way back to our part of town, Palermo. 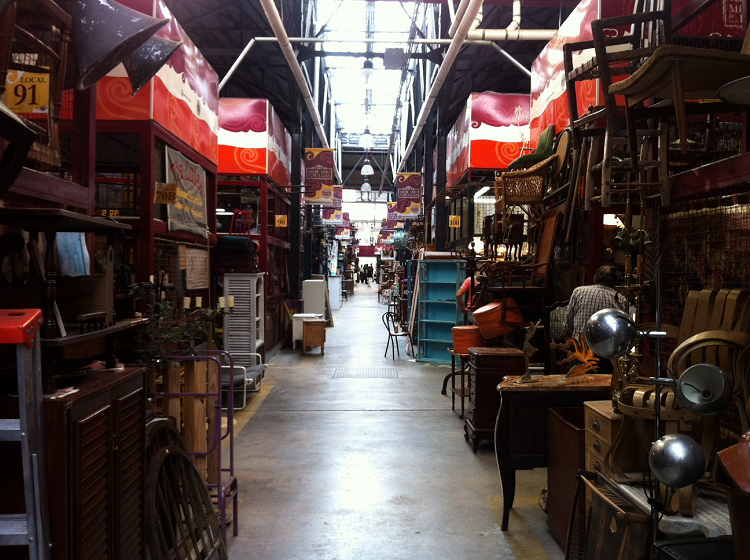 But instead of hitting the apartment right away, we stopped at Mercado de las Pulgas - the flea market! There was tons of furniture (some mid-century gems!) and some stalls were piled high with junk that it almost seemed more like an art installation and not a vendor booth. If one item was removed from the piece, it seemed as if the entire structure would come crashing down. That didn't stop us from purchasing a few little items for family back home that stood out to us. After the flea market, we took our typical time to relax at the apartment around 7 pm, right before portenos (what the people of Buenos Aires call themselves) go out to dinner at 9 pm. We normally eat around 8 pm at home, but oddly enough, that is pretty much the earliest time that you will find a restaurant open for dinner here! We decided to go to a nice parrilla in the area. A parrilla is a place that South America is known for: grilled meats! Our server brought us chimichurri which I haven't had since my dad brought me back some from his trip here! It was delicious. The steak tenderloin that we shared was cooked perfectly medium rare, and was tender and juicy. The chorizo sausage we had was the most flavorful I've ever had, with the most wonderful char on it from the grill. We also tried the sweetbreads, which didn't do anything for me - I enjoyed the sweetbreads I had in New Orleans much more. It was a nice enough dinner, but I think next time we indulge in a parrilla on this trip, I want it to be at a small local joint and not somewhere where they serve you complimentary champagne if you have to wait for a table. Complimentary champagne is a good thing - trust me! But a small place with an open grill and less formal is a bit more my speed.